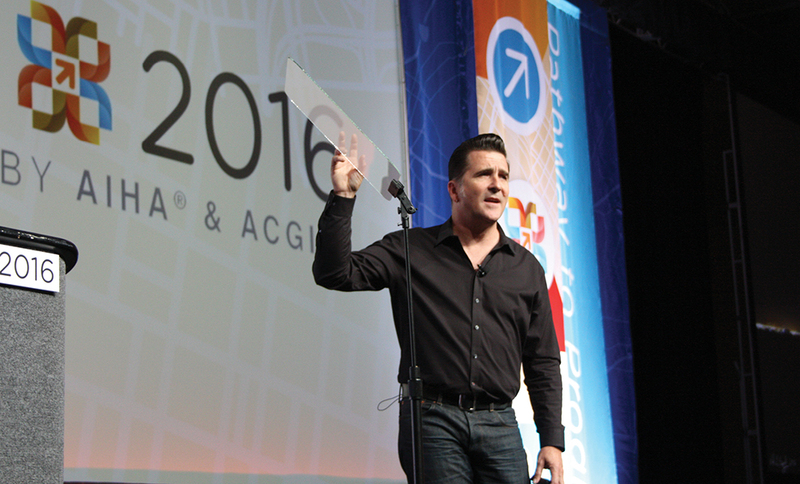 NASA’s Adam Steltzner discusses the landing of the Mars Rover Curiosity at the Opening General Session of AIHce 2016. Access this article from a desktop or tablet computer to view a slideshow of images from AIHce 2016. Innovation and risk: you can’t have the first without the second. Whether you’re landing a spacecraft on another planet, protecting workers from exposure to nanomaterials, or launching a new initiative to train occupational hygiene practitioners, you’re grappling with the paradox that no progress is possible without risk, that risk is inherent in any worthwhile endeavor. In one way or another, these ideas informed the keynote sessions and lectures at AIHce 2016 in Baltimore, Md., where thousands of professionals gathered May 21–26 for the largest annual conference devoted to occupational health and safety. TIME TO ACT During the Henry F. Smyth, Jr. Award Lecture on May 23, Michael Ellenbecker, a professor at the University of Massachusetts-Lowell, discussed the uncertain toxicology surrounding engineered nanomaterials and the need to protect people and the environment. Although occupational exposures are well known, Ellenbecker said, “In some respects, our field is not paying enough attention to the hazards of nanomaterials.” Of special concern are carbon nanotubes (CNTs). Workers may be exposed to CNTs in research and development labs and in production settings, where the engineered nanomaterials are incorporated into products ranging from small, advanced memory devices to larger items like automobile bumpers. Ellenbecker urged greater attention to CNTs, given their potential to cause mesothelioma. Safety data sheets for CNTs, which are supposed to communicate their potential hazards, have been “seriously deficient,” he said. While Ellenbecker is skeptical that nano-specific regulations will be promulgated anytime soon, he expressed hope that governments could reach agreement on a standard protocol for evaluating exposures to engineered nanoparticles, including the consistent development of OELs. Today, vast differences exist between exposure levels from one country to the next. The proposed NIOSH recommended exposure limit (REL) of 1 μg/m3 of respirable elemental carbon, for example, differs from the comparable European Union value by a factor of 460,000. NAIL SALONS, UNVARNISHED The 16th Annual Upton Sinclair Lecture for Outstanding EHS Investigative Reporting May 24 acknowledged Sarah Maslin Nir of The New York Times for her reporting on the health hazards faced by workers in New York City’s nail salon industry. Nir’s investigation “Unvarnished” was published last May in two parts, “Perfect Nails, Poisoned Workers” and “The Price of Nice Nails.” Soon after her articles appeared, New York Governor Andrew Cuomo introduced a new state law to raise the health and safety standards in nail salons. The most common health effects in nail salons include repetitive motion strain and skin, eye, and respiratory irritation. Many veteran manicurists sport scars on their forearms from resting them on a manicure table. At least one manicurist Nir spoke with had a persistent cough and was eventually diagnosed with sarcoidosis of the lung, an inflammatory disease thought to be caused by exposure to acrylic powder. Under New York’s new safety requirements, salon owners must provide certain personal protective equipment, including a properly fitting, NIOSH-approved N-95 or N-100 respirator, for manicurists to use when buffing or filing nails, or when using acrylic powder. Salon owners must also post a new “Bill of Rights” for nail workers in plain view. The effects of Nir’s reporting are still being felt: in May, Gov. Cuomo directed nail salons to repay $2 million in lost, unpaid wages to more than 600 workers, and many consumers have a new awareness about the occupational hazards of nail salons. When asked why she thought her story gained so much traction, Nir told attendees it’s because the workers affected by the hazards in nail salons are right in front of readers. “I think what we need is some youthful energy and daring spirit, and guess what that is? It’s risk taking." BEST HOPE Ten years ago, Roger Alesbury and Stephen Bailey began discussing a topic that concerned them greatly: the vast gulf between the need for industrial hygiene expertise around the world and the number of practitioners available to fill it. So they started laying the foundation for what may now be the world’s best hope for protecting worker health in developing nations. Today, the Occupational Hygiene Training Organization (OHTA), an organization that Alesbury and Bailey founded in 2010 to cultivate industrial hygienists in local areas, has conducted 600 IH courses in 40 countries, supported the creation of at least one new national industrial hygiene organization, and drawn more than 100,000 users to its OHLearning.com website. In recognition of OHTA’s actual and potential achievements, AIHA acknowledged Alesbury and Bailey with the 2016 William P. Yant Memorial Award, which honors individuals residing outside the United States who have made outstanding contributions to industrial hygiene. This year marks the first time that the Yant Award, presented annually since 1965, has been granted to multiple winners. At the Yant Award Lecture on May 24, Alesbury and Bailey discussed their vision for a localized training network and described OHTA’s improbable growth. Largely through the support of professional societies and multinational companies, OHTA has built training modules in several industrial hygiene topics, translated them into multiple languages, and delivered them to individuals interested in protecting worker health in their native countries. So far, the number of people trained by OHTA is a tiny fraction of the total needed. Both Alesbury and Bailey acknowledged that fully meeting the demand for IH expertise is a tall order, but they expressed hope that additional support for OHTA from volunteers and organizations will eventually achieve significant gains for industrial hygiene. “It’s not perfect, but this is an organization that has been designed to evolve,” Alesbury said. “If you don’t like what you see, you have the power to change it.” A NEW LANGUAGE AIHA Fellow Fred Boelter urged attendees to expand their professional focus beyond exposure during the Donald E. Cummings Memorial Award Lecture on May 25. To continue to improve worker health in today’s changing workplace, Boelter said that industrial hygienists must “learn and express a new language” related to the larger world of risk, which includes both occupational and non-occupational risk. In a world “abundantly populated with risk,” Boelter noted that industrial hygiene professionals must look beyond their own perceptions of risk to understand how it’s perceived by workers and the general public. People don’t think about risk in terms of a mathematical equation, he said, and risk acceptability differs from person to person. Industrial hygienists’ unique relationship with workers and employers puts them in a position to raise awareness about health risks that go beyond exposure, Boelter explained. Moving forward, industrial hygienists should focus on learning skills that will help them change workers’ behavior. “If our message and story is not being discussed in the board room, it’s not being retold,” he said. Toward the end of his talk, Boelter contended that the industrial hygiene profession will have to take some risks to succeed in protecting worker health over the coming years. “What would become of worker health if our profession disappeared?” Boelter asked his audience. “I think what we need is some youthful energy and daring spirit, and guess what that is? It’s risk taking. The future of worker health may just depend on it.” KAY BECHTOLD is assistant editor of The Synergist. She can be reached at (703) 846-0737 or kbechtold@aiha.org. ED RUTKOWSKI is editor in chief of The Synergist. He can be reached at (703) 846-0734 or erutkowski@aiha.org. For more Synergist coverage of AIHce 2016, visit the AIHA website. Swipe to see next image in slideshow. Click the arrows on either side of the image to advance the slideshow.